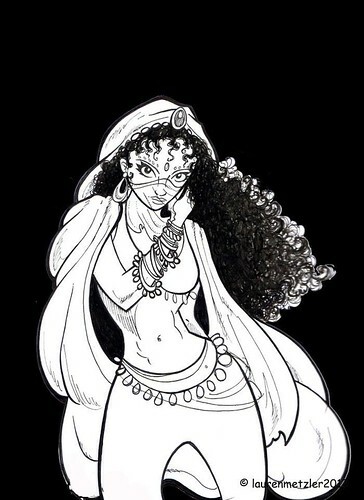 I first learned of Lauren, this Gypsy Artist from Oregon who was traveling the world and documenting it through her doodles and comics, through another blogger friend Regin of reginstravels.com. It had started with the Sole Sister Search and Lauren showed us that brilliant video of her Thai students dancing the Americano. Her hopes for becoming a Sole Sister did not end after the votes were cast. 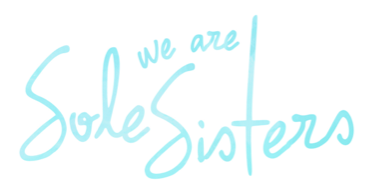 When Sole Sister Madz's stint ended early this year, (because she had chosen to pursue her first love of makeup and fashion) I came up with a bigger vision for wearesolesisters.com. Lauren and I had continued to keep in touch and I asked her to be part of the sisterhood. What’s the favorite place you have visited and why? This is a very difficult question, as I love different places for different reasons. Each place holds a special memory in my heart, but if I had to pick one, it would be Tacomepai Organic Farm! It’s located 6km outside of Pai in Northern Thailand. I decided to travel there on a whim after receiving instructions on how to get there by a fellow solo female backpacker. 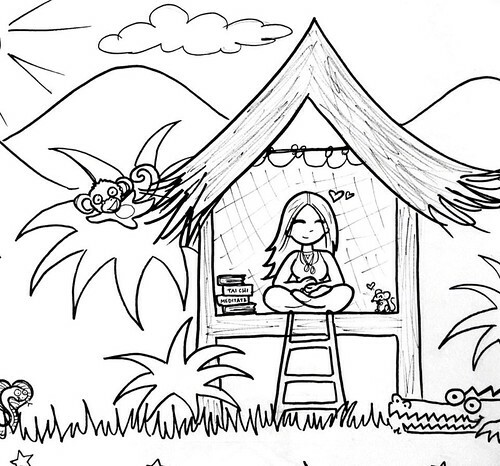 I spent two weeks in a tiny bamboo hut meditating, practicing Tai Chi, planting crops on the New Land and meeting amazing people who became like family to me. It was one of the best experiences of my life, and not a day goes by that I don’t dream about my time there. 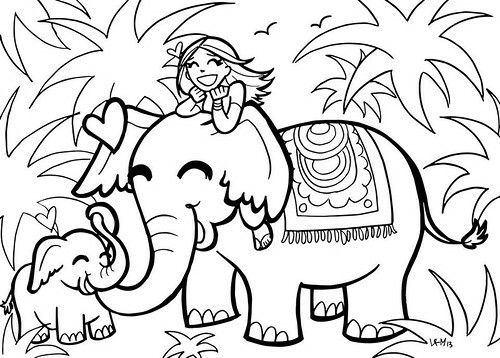 What’s the best lesson you have learned from your travels? Don’t be afraid to travel alone. I’ve found that when I travel alone, I am more open to meeting new people. 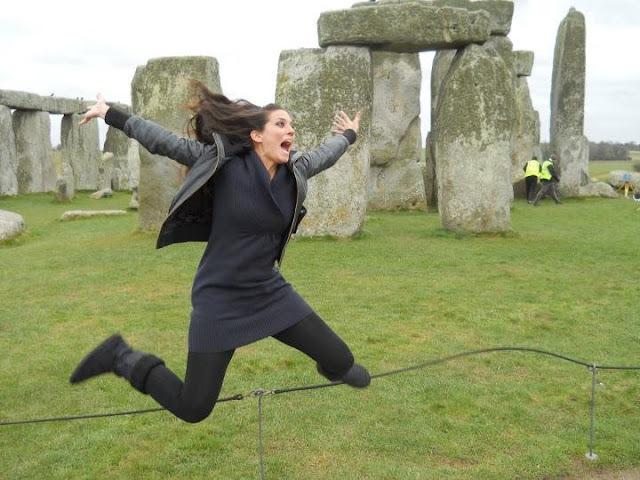 Soon, I find myself surrounded by new friends with new, crazy travel ideas that I never even dreamed of doing! My travel plans thus change from my boring itinerary to scuba diving in a ship wreck or working on an organic farm! Any funny stories to share from your travels? When I first began my travels, I decided to go from Vientiane, Laos to Hue, Vietnam. Big mistake! On the way to the bus station, everyone was excitedly talking about Hanoi, making travel plans together to visit Ha Long Bay and getting ready to party down in the night bus on their way there. When we arrived at the bus station, the bus driver asked, “Who is going to Hanoi?” and to my horror EVERYONE raised their hands except me. I sadly watched them all pile into a huge, air conditioned, brightly lit bus…chock full of Backpackers! “Are you going to Hue?” the driver asked. “Yes!” I squeeked, still looking at the party bus full of lost potential travel buddies. We walked around the back of the bus station where my bus was…it was old and tiny and half of the seats were made out of bags of rice! I had twenty hours on that bus, and it broke down twice in the night! I still laugh about how much of a newbie traveler I was back then! Show us 3 of your favorite artwork and describe why they are meaningful to you? This is the one that started it all! My first travel comic book! 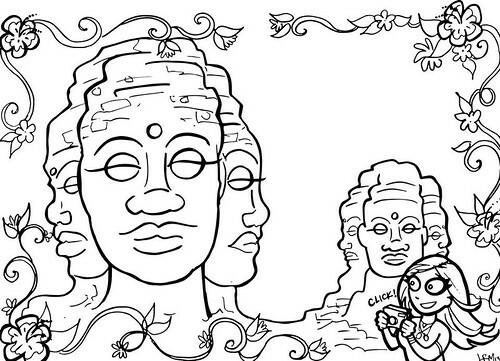 I drew it after I met a boy in Vang Vieng, Laos. We spent 10 Days together traveling around Thailand and falling in love. Long story short- we didn’t last, but the comic book did! I hear Vang Vieng isn’t even around anymore! I still look back and smile at how much “blood, sweat and tears” went into this comic book, and how much my art has evolved since then. I think it took me about a month to draw it…longer than the time we spent together! Ah...to be young and naïve! Still, this comic book changed my life, giving me the foundation for pursuing my dreams and the crazy idea to start a Travel Comic Book! I have always been called a “gypsy” because of my lifestyle. I have been cursed with what they call “itchy soles”, wandering the globe looking for something to quench my insatiable thirst for travel and adventure! I drew this for a fellow female traveler that I have known since I was little, and this picture is dedicated to her and her adventurous spirit! Is there any work you had to do or are currently doing in order to beef up your travel fund? I am currently living and working in Australia on a Working Holiday Visa. This allows me to work and save money while exploring this beautiful (yet expensive!) country. I am a poor backpacker, and since coming here, I’ve earned enough to travel all around Sydney and the beautiful Northern Beaches, up to the Blue Mountains, and down to the wilderness of Tasmania! I am currently saving for a snorkeling trip in Cairns and trekking in New Zealand! Also, since traveling to Australia (and learning how to surf) I’ve started painting surfboards for locals. 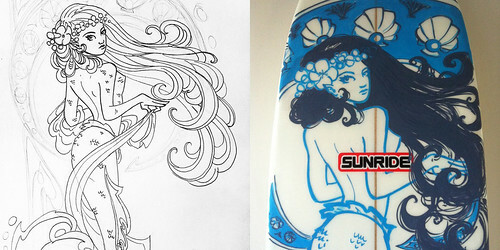 From sketchbook to surfboard, I love coming up with an idea then painting it on the slick surface of a surfboard, knowing that my artwork will be out there catching some waves! What bucket list items have you crossed off recently? I am currently learning how to surf in Australia! My first time was rather lucky, and I caught a wave without even trying! Of course, that was with a foam board. The last time I went, the waves were so huge I got smashed in the face by my own surfboard! Needless to say, I’ve learned my lesson and keep my board beachside! How do you see yourself as a traveling artist? I’ve always drawn comic books since I was a little kid, sketching out the X-Men and my very own creation, “The Powerful Pumpkin!” (He is a super hero who fights cavities and malnutrition!) When I started traveling three years ago I always kept a sketchbook with me, drawing landscapes and the people I met along the way. Only recently did I put two and two together and… WHAZAM! 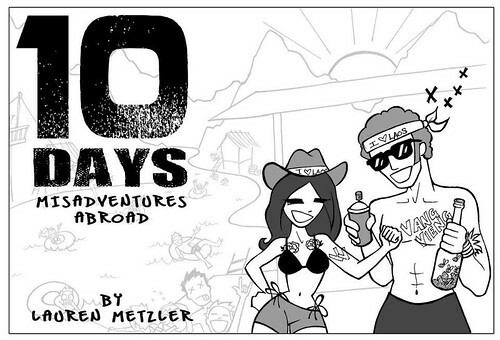 I woke up and thought to myself, “Why don’t I start a travel comic book!?! !” People love cartoons! And I enjoy drawing them. Thus, the Wandering Orange was born! What are the things you can’t travel without? My sketchbook, drawing pencils/pens, and a sense of Adventure! Who is the most memorable person you have met on your travels? I’ve met so many amazing people who have inspired me along my travels and shaped me into who I am. Without their love, enthusiasm for travel and warm encouragement, I would not be the traveler I am today! One such person is my friend, Ben. He’s been traveling solo for almost two years; motorbiking across Myanmar, living on a secluded island in the Philippines, volunteering at an orphanage and even living in the jungle in Taiwan! His stories are what inspired me to go for my dreams!. I even went bungee jumping after he told me that I would love it! 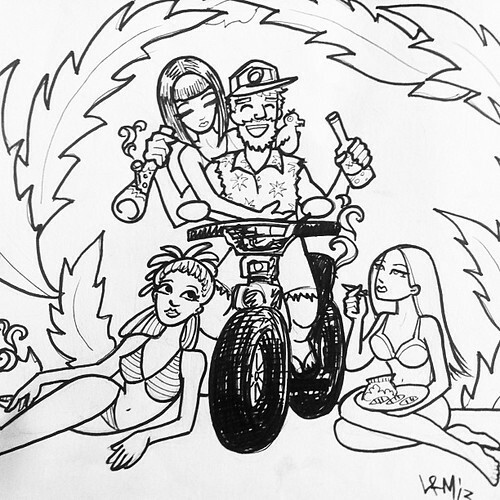 I recently drew a funny satire of him on his motorbike, surrounded by women in the jungle! Have you ever fallen in love while on the road? Of course! It’s hard not to fall in love when you are with the perfect person, in the perfect place. I’ve had people tell me, “Don’t fall in love on the road!” because of the heartache and all that jazz, but isn’t it better to just accept what is there and love that person, even if you have to say goodbye someday? I’ve recently fallen in love with someone in Australia. Luckily, he likes to travel too. Where are you off to next and what places are on your wanderlist? After a few more weeks of saving, I will be off snorkeling the Great Barrier Reef, trekking across New Zealand, and going Skydiving!!! Eeee! What advice can you give women to make travel happen? Just buy the ticket! If you wait for the perfect time to travel, you might end up waiting for the rest of your life. Do whatever it is in life that makes you happy, regardless of what others might think. If you want to travel, then just do it! In the end, the people who love you will support you no matter what! Whether it’s traveling solo to Southeast Asia or trekking across New Zealand, this life is your own and only you can make it worth living! Follow your heart, and the rest will follow. Lauren grew up in rural Oregon, where she spent most of her time swimming in local rivers and waterfalls, hiking nearby forest trails and searching for hidden faerie homes in fallen tree trunks. 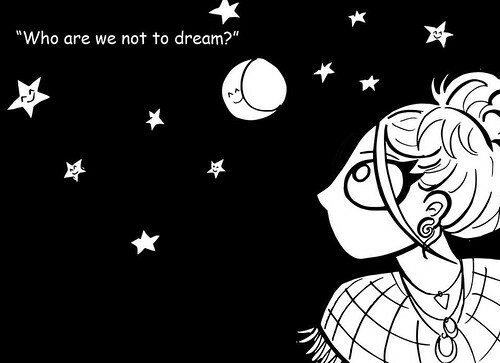 For over three years, she has been traveling and drawing comic books about her adventures throughout Europe, Southeast Asia, the UK and Australia. She is currently learning how to surf and painting surfboards for locals in Sydney. 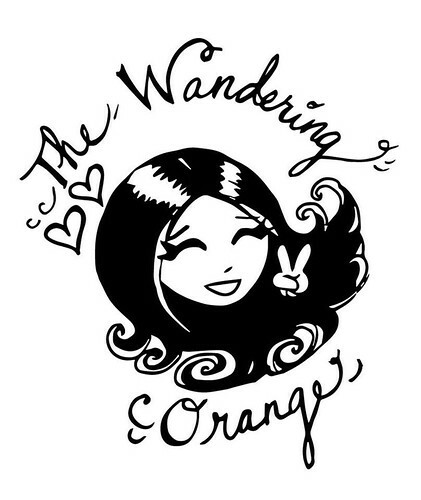 Get your dose of humor and wanderlust when you check out her travel comic, The Wandering Orange. Want more? Read other features on Sole Sister Spotlight. 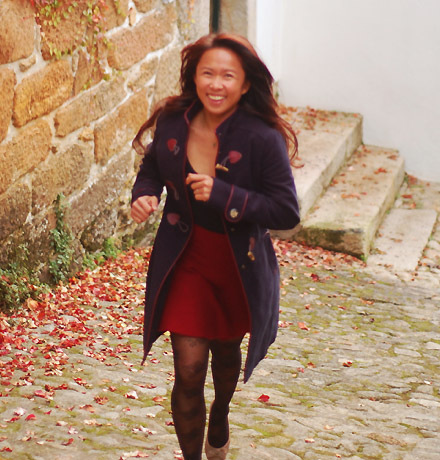 Do you know of female travelers who conquer the world one country at a time? Sole Sisters are fearless women travelers who find ways to travel within their means and have a lot of fun along the way! We would love to interview them for Sole Sister Spotlight. Please send us an email at solesisters (dot) weare(at)gmail(dot)com. We look forward to your suggestions! Tomorrow, we will be announcing the full roster of Sole Sisters! Watch out for that! Get a FREE copy of the Sole Sister Guide to Planning an Epic Trip by subscribing to our newsletter. You can also hang out with us online on Twitter, Facebook & Instagram. 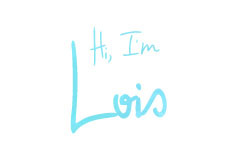 She was actually my favorite video in the entries. Glad to see her as a Sole Sisters... and glad to see a fellow Oregonian as well :) I also grew up in rural Oregon, or the 'burbs of Portland.. But I thought they called it "itchy feet", not itchy soles.. although that sounds more appropriate for this site :) Love Lauren's artistic talent.. have fun in New Zealand skydiving!! !